Transcriptions were really important in Puccini’s lifetime. Publishers like Casa Ricordi, for example, listed many hundreds of them, in addition to fantasias and pot-pourris. These were produced for piano solo, piano duet, or indeed most instrumental ensembles large and small, and their raison d’être was pretty obvious. Today we are spoilt for choice in how we can listen to music, or watch operas, and can bring symphony orchestra concerts and fully-staged productions not only to the comfort of our living room, but also to our mobile phones and tablets. Before all this technology, transcriptions similarly brought the music of symphonies and operas into the home, but, because this was via a musical score, it then had to be played in situ. This was exactly what publishers and amateur musicians alike wanted, at a time when both were in their heyday. If people were lucky enough to get to a performance of La bohème, now they could play some of the best ‘tunes’ from the opera in the privacy of their own homes, or at a small party or soirée afterwards, where there would still be sufficient challenge in the score, but without needing professional musicians to perform it. The excellent CD booklet here, in Italian and English, mentions the fact that Schumann had actually been able to write a review of Berlioz’s Symphonie fantastique from Liszt’s piano transcription, not yet having heard the original orchestral version, such was the quality, insight and ingenuity of Liszt’s working. It still went a long towards producing the many different orchestral timbres and colours, but from just one performer on one piano. Given the actual publication date of Berlioz’s score, Liszt’s transcription may well even have been put together ‘by ear’, and I think this might be the crux of the matter. This, I feel, is what tends to let this CD down somewhat. None of Puccini’s contemporaries who have contributed a piece or two here – even Giacomo’s younger brother Michele – gets little more than the barest mention online. It is very clear that not one of them inhabited the same world as Franz Liszt – or even Sir Charles Mackerras, whose pot-pourri ballet, Pineapple Poll, I refer to at the end of this review. As far as the CD’s five pure transcriptions or riduzioni (reductions) are concerned, their success stands or falls depending on the arranger’s ability to capture a full orchestral texture, and recreate this with just two players at the piano, and their judicious use of the right-hand sustaining pedal to help fill in the implied harmonic overtones. The two pot-pourris, and single Fantasia that remain – the terms are almost synonymous here – additionally rely on the arranger’s facility in choosing particular parts of the opera, or original work, and juxtaposing them, often to create surprise and added interest. Of course, because they often link arias and passages from different parts of a work, there are a lot of key changes involved; some of those work more effectively than others, and short connecting passages have to be constructed, where a natural link would not really be viable. The booklet does offer a fair deal of information about the works, both in providing some interesting background material, as well as a mini-analysis which aims to identify from which part of the opera a various melody, or even snippet, comes from, especially where a pot-pourri or Fantasia is involved, and the tunes are not used in the order they would appear in the opera itself. Bernardo Wolff’s pot-pourri on La Bohème has its moments, but frankly, at almost twenty minutes long, were it not for Puccini’s always-memorable writing, it could perhaps do with a little judicious pruning. Yes, the opera is awash with melodies, but you cannot get them all in, given that its running-length in the theatre is almost three hours with the usual intervals. Giuseppe Frugatta’s piano reduction of the Capriccio Sinfonico, which Puccini wrote as a thesis composition at Milan Conservatory, emerges as far more interesting and engaging, perhaps because it is less familiar, even if it is still unmistakably Puccini, and even if occasionally uses fragments which will appear later in one or two of his operas proper. Places where it scores significantly over Wolff’s work are where melodies have greater chordal support from both players That results in a far more convincingly orchestral texture than where a melody might just be assigned to the Primo (top) player in octaves. Frugatta does make use of the piano’s only real ‘weapon of sustain’ – the tremolo – but not excessively so, and it is effective as such. Ernesto Becucci’s Fantasia on Madam Butterfly sounds strangely as if only one player is involved on a number of occasions, for example the blossoming love-duet which sound rather thinly anaemic the first-time round. Even its later reprise does not really hit the spot, with not much passion involved – hardly, though, the fault of the pianists, but rather the weakness of the arrangement at this point. Michele Puccini’s reduction of his brother’s Scherzo (the final movement of Giacomo’s String Quartet in D, the opening theme of which will appear later in operatic guise) again comes over successfully as a piece of piano-duet writing, perhaps because it has been completed and revised by Mauro Fabbri, who, in the absence of any further information to the contrary in the booklet, is a fellow-Luccan pianist, conductor and composer, born in 1970. This is then followed by Two Minuetti transcribed by Guglielmo Andreoli, which may be considered as a tribute from one famous son of Lucca to another, Luigi Boccherini. They enjoyed a good deal of success, even before they were used at beginning of Puccini’s Manon Lescaut. Once more, like the earlier Fantasia on Madama Butterfly, the effect is almost that of a single pianist, with just the odd moment or two where a second pair of hands is needed, rather than appearing to make the best use of the extended keyboard. In contrast, Carlo Carignani’s transcription of the Intermezzo from Manon Lescaut does make fuller use of the two players, and, as a result, tends to simulate the original orchestral texture more faithfully. I do not think it was by accident, however, that Italian record-label Tactus and the performers decided to round off their CD with arguably its most effective offering – another Bernardo Wolff pot-pourri, this time of Tosca. Whether in the three years that separate the earlier Bohème example, and this one, Wolff had somewhat rethought his approach, both with regards the way the tunes appear and are linked, and more so in the more effective use here of his resources, often producing some exciting moments along the way. It is four minutes or so shorter than the Bohème pot-pourri, and this does make a difference, too. 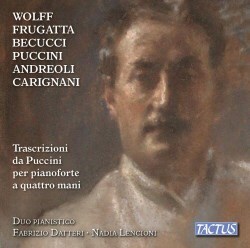 The CD provides a useful insight into these kinds of piano-duets which were popular at the time Puccini was working. If you are a fan of the composer, it is a bonus to hear his eminently-tuneful, familiar melodies played on the piano. The quality of each piece is somewhat variable, but this is down to the skill of the arranger, and certainly not the performers or recording, which are both excellent. Generally speaking, it is the non-operatic-based pieces which appear more successful. Perhaps part of the reason here is that, while the piano used is the ubiquitous Steinway D 274, a contemporary instrument from Puccini’s time might have provided a warmer and more sympathetic sound when attempting to emulate the voice, or Puccini’s lush orchestration, than the more clinical precision of the German concert grand. Modern Italian Fazioli grands unfortunately were not around before 1981, but the brand would not necessarily be an exclusive substitute. For those works which are merely transcriptions, or piano reductions, there are always the original orchestral or string versions to fall back on. With pot-pourris and Fantasias, there is not the same luxury, but the effectiveness of Mackerras’s ballet, Pineapple Poll (1951), which consists of a number of pot-pourris drawn from the operettas of Gilbert and Sullivan, might suggest that, in the absence of a piano-arranger of the calibre of Franz Liszt, orchestral, rather than piano-duet pot-pourris might have seemed the better option. But this, of course, is just speculation, and certainly not in the remit of this alternative version of some of Puccini’s music, which will surely be of interest to some of the composer’s many aficionados, or simply those who enjoy playing piano-duets for whatever reason.